I had honestly not given crusty bread much thought until we some time ago ate, no, devoured crusty toasted bread smeared with basil pesto at a restaurant. My family enjoyed it enough to order a second platter. That pesto smeared bread made me want to bake some and eat it with all my favorite toppings! 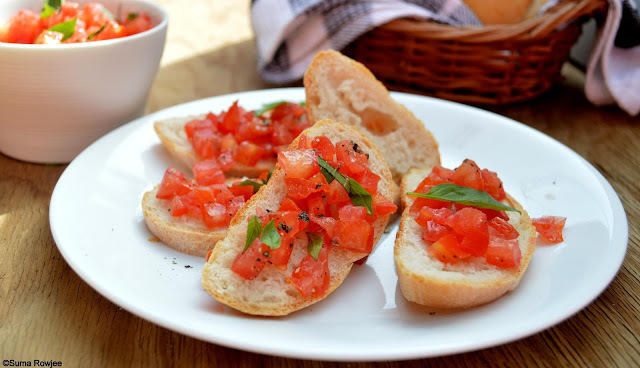 With fresh tomatoes, garlic, basil, EVOO, salt and pepper or sauteed herbed mushrooms, Romesco or the simplest of spreads even from a jar, this would be good. The possibilities for the toppings are limited only to your creativity, imagination and convenience - exactly what lured me into baking a French bread. Looking at most recipes for quick French bread, this is simply your basic white bread sans the fat, shaped into a log and baked. If you are looking for bread with all those gorgeous irregular holes, this isn't really the recipe as it doesn't have that high percentage of hydration. So essentially, a wet slack dough, which is not as easy to handle, gives you a hole-y bread. I had in fact baked one with higher hydration percentage aeons ago. It looked gorgeous, but something in it did not really work for me. Pictures of such bakes normally end up as just pictures in my feature posts. Ouch!! Though a slow rise version or one using a pre-ferment would undoubtedly win flavor-wise, its comforting to have these quick versions in your repertoire. Sliced thin, baked or toasted on the griddle ( I like it that way) with a drizzle of extra virgin olive oil, crispy there and chewy here, this seemed to be reasonably good. One I shall be baking again. Recipe based on this recipe from All Recipes with slight modifications, hopefully alright. Still sharing this as it made some decent bread. I have added vital wheat gluten to the flour and omitted the egg wash. I have mixed the dough in my bread machine. I was able to make a 9'' - 10'' log with the recipe proportions below, feel free to double the recipe if your oven can accommodate. Combine all the ingredients for the dough and knead on a lightly floured surface for about 8-10 minutes or till fairly soft, smooth and elastic. (If using active dried yeast you will need to proof it) Add extra water or flour teaspoon by teaspoon as needed till your dough reaches the consistency. Place the dough in a greased bowl or dough rising bucket, and turn once. Cover, and let rise in a warm place until doubled. This may take 30-40 minutes or more depending on the atmospheric temperature. Go by the indicator as your guide. Note down how long this takes as it may help approximate the time needed for the second rise. Grease your baking sheet or tray generously with oil. Keep aside. Once the dough doubles, punch it down. Lightly flour your work surface, transfer the dough onto it. Cover, and let rest for 10 minutes. Roll into a rectangle depending on the size of your baking tray. Roll up, starting from the long side. Moisten edge with water and seal. Taper ends. Place the loaf seam side down on the baking sheet. Brush off any excess flour with a large brush. Let rise in a warm place till it doubles. Place the loaf seam side down, on the prepared baking sheet. Let rise in a warm place until doubled, 30-40 minutes. A safe bet would be around the same time as the first rise. Towards the end of the second rise pre-heat oven to 190 degrees C/ 375 degrees F.
I always do a terrible job of slashing loaves, but if you really want to, carefully without deflating the loaf, make 3-4 diagonal slashes before you bake the bread. Bake for about 30-35 minutes or till the internal temperature of the bread registers 200 F. The bread doesn't brown a lot (unless you use egg wash). The most reliable way to do this would be to approximate the baking time and check the internal temperature. Remove the bread from the oven, cool to room temperature before slicing. 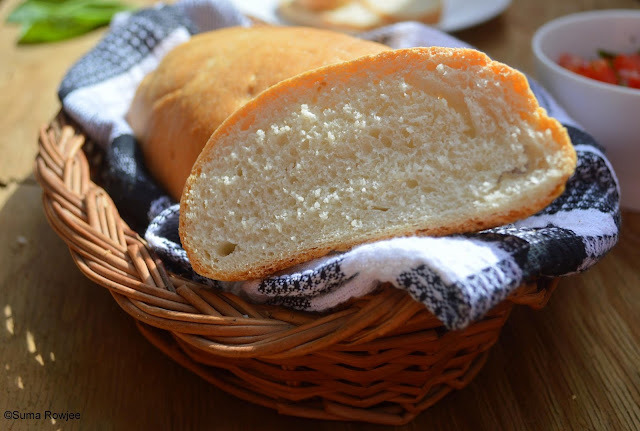 The bread goes stale really fast as it has no fat in it, therefore best eaten the day it is baked. But in case you are left with some try throwing it in a savory bread pudding. 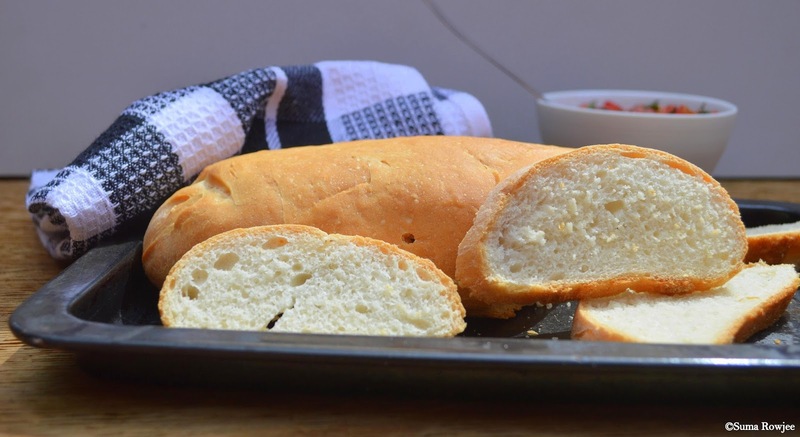 Please note: Some recipes for quick French bread are made with slightly wetter dough and a shorter knead time. The shorter knead is for the gluten to develop during the longer rise. The dough when slacker can't hold its shape as it bakes in the oven, hence the second proof is only till the dough 'almost' doubles. My dough wasn't wet or even tacky, so have let it double before baking. Steam in the oven (by throwing ice cubes on the floor of the oven or sprtizing water on the walls) when you start baking supposedly helps make a crispy crust. I am way too chicken to attempt doing this, so will be content with the crusty enough crust I got. The original recipe calls for all purpose flour, I shall be trying that too. Less yeast, cool water and all that! If things work better, shall update here. Which is your favorite quick crusty bread recipe? And what according to you really makes a great one? Tell me! This bread looks amazing! 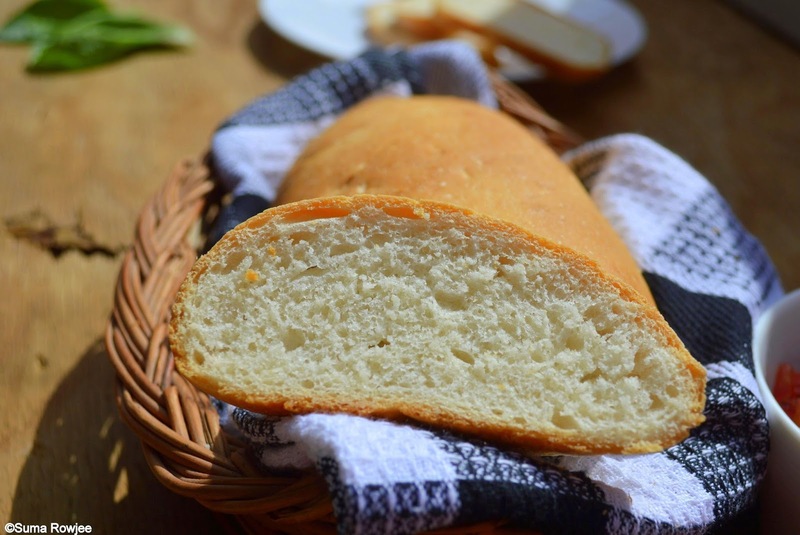 What is Vital wheat gluten? I'm not sure I can get this in Australia. WOW! Your bread looks so soft and delicious. I would love to grab a piece off my monitor!!! It is so good to be reading your blog! And a pleasant surprise too. I was randomly looking for a food colour blog and imagine my surprise stumbling upon yours! Your blog is very interesting and kudos to it! Lots to catch up and learn from you. To know we have such a pro baker right in family is a lot encouraging for a novice like me!